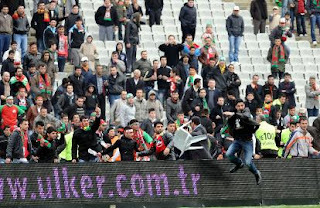 Yet another Diyarbakirspor game was called off as a result of riotous fans. In a game against Istanbul Buyuksehir Belediyespor on Sunday, appoximately 40 Diyarbakirspor fans began to charge the field and/or throw objects during the last minutes of the game. Diyarbakirspor made it into the Super League this year, but has been plagued by troubles since a game played in September resulted in some Bursaspor fans spoiling the game. In apparent retaliation, some Diyarbakirspor fans caused grief for Bursaspor at a game played in Diyarbakir about a week ago. Diyarbakirspor is used to people shouting anti-PKK slogans, wrongfully associating the team with the terrorist group, but the Bursaspor provocation was unprecedented. Such an association is not correct since the PKK no doubt does not approve of the team. There is some question as to whether the referee should have called off the game so close to its end. Now that he has, Diyarbakirspor faces being booted out of the Super League since the Turkish Football Federation (TFF) has a rule that teams cannot lose by default more than once. The TFF is already set to discuss the game played in Bursa. Istanbul Governor Muammer Guler criticized the referee's decision, saying that the low number of fans and the high level of security at the game made calling off the game unnecessary. Guler further said that the referee was "paving the way for provacateurs." Kurdish BDP leader Selahattin Demirtas also weighed in during Newroz festivities in Diyarbakir, urging the TFF to take care in making its decision about Diyarbakirspor. Demirtas said the TFF should take steps against fans who shout harassing and "discriminatory" slogans at Diyarbakirspor players. Today's Zaman reports that State Minister Faruk Ozak is said to be working on a new law on hooliganism, as well as implementing measures to control fans at football games. Meanwhile, Diyarbakirspor and organizations in Diyarbakir are arguing that the continued problems are the result of a failure of TFF to properly punish Bursaspor for the September game. UPDATE I (3/19) -- The TFF ruled not to push Diyarbakirspor out of the Super League despite the two defaults the team has received.